Success in today’s marketplace requires both great planning and sparkling execution. With sales volume of promotions approaching 50% in many retail businesses, staying in stock at the store level is critical to retailers and the wholesale businesses that support them. HIMPACT provides buyers with a robust set of tools to support promotional planning and execution. The first step for successful promotions is having flexible tools that can best utilize the information available during the planning phase. 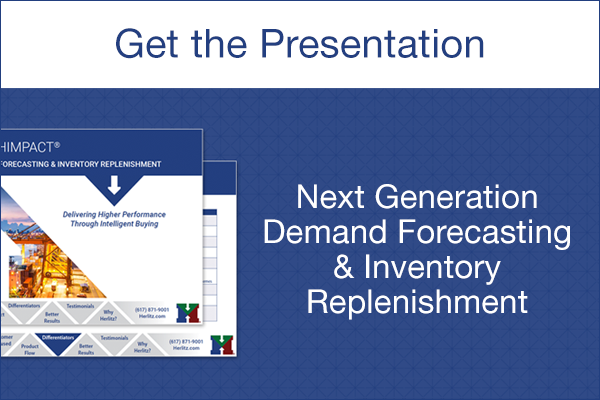 Having a demand forecasting system that properly segregates lost promotion and event-related sales from regular sales is critical. If you are not segregating your demand history, you won’t be able to see the promotional lift of previous events and utilize that information in planning. It must seamlessly integrate your order quantities of future promotional plans into your replenishment buying. Using information at location/SKU level is the most effective way to plan new product roll-outs and future promotional events. Having a state-of-the-art event planning engine that supports your planned purchases and customer bookings along with setting start and end dates, profiles for the distribution of promotional demand, cannibalization of demand on other products, or lift on complementary products goes a long way to ensuring success. HIMPACT supports both bottom-up or top-down planning strategies, or a combination of the two. It allows you the flexibility to develop action plans that best fit the vendor and product characteristics. Whether you are positioning made-to-order merchandise for pre-season or in-season planning, or rolling out a brand extension of a well stocked CPG product, you have the ability to choose the right combination of planning and execution that best support business strategy. Promote, Plan, Book, Allocate, & Simulate… then Execute! The second step for success is proper execution; the integration of promotions, planned orders, bookings, and hold-outs into regular replenishment orders. HIMPACT time phases the arrival of this inventory needed to support your event. During the event period, demand alerts will identify potential service issues to the buyers. HIMPACT’s proprietary algorithms readily identify spikes and shifts in demand. With the drill-in capabilities, looking at segmented customer demand by day and week, you will be able to identify the source of demand changes and take appropriate actions. Our solution’s multi-echelon planning and collaboration capabilities enable you to have greater visibility to information, internally or externally with key suppliers. HIMPACT Event Planning supports your promotional planning and ensures that the execution will be a success.